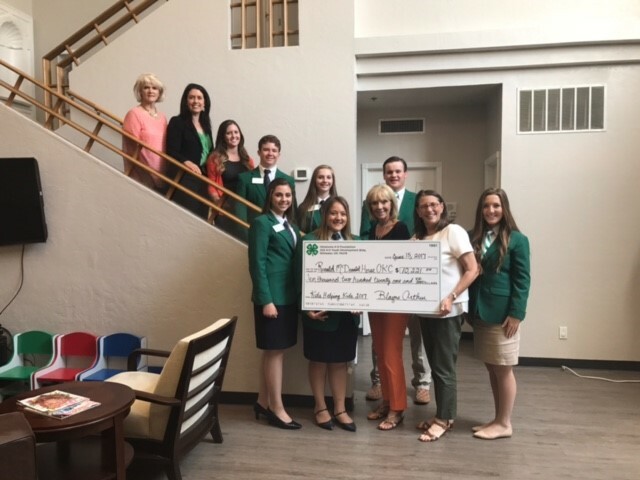 The Oklahoma 4-H Foundation recently presented a $10,221 check to Ronald McDonald House Charities (RMHC) in Oklahoma City. This check represents a 29-year partnership between RMHC and the Oklahoma 4-H Foundation through the “Kids Helping Kids Campaign”. On hand for the check presentation were Oklahoma 4-H Ambassadors Hadley Griffith, Madison Stephens, Tori Booker and Rio Bonham, Oklahoma 4-H State Council Members Montell Meyer and Rachel Dockery, 4-H Foundation Executive Director Blayne Arthur, 4-H Foundation Staff Member Sarah Dunn and Kids Helping Kids Program Coordinator Kristin Knight, as well as RMHC Board Member Sue Horrocks and RMHC President and CEO Susan Adams. Each year Oklahoma 4-H members from around the state participate in the Kids Helping Kids Campaign. Club members have raised more than $900,000 through this service project/fundraiser over the past 29 years. This fundraiser seeks donations in exchange for a coupon to participating McDonald’s restaurants in Oklahoma. Kristin Knight, coordinator of the Kids Helping Kids Campaign in the State 4-H office, said 50 percent of the funds raised go directly to the Ronald McDonald House Charities of Oklahoma City, a nonprofit that provides a home away from home at no cost for families with seriously ill or injured children receiving medical care in the Oklahoma City area. Prizes were awarded to the top three selling clubs and top three individuals on the state level, as well as the top three individuals in each county. Plans are underway for the Kids Helping Kids Campaign in 2018, which will mark the 30th year of participation for Oklahoma 4-H’ers. The Oklahoma 4-H Foundation provides a private, non-profit source of support to the mission and goals of 4-H youth development at all levels in Oklahoma. The 4-H Foundation is dedicated to supplying financial resources to meet the needs of an ever changing diverse population, and relies on individual, corporate and foundation partners to achieve these goals. To learn more about the Oklahoma 4-H Foundation or donate online, click here.